This week, we have a post from regular contributor Nick Mancuso on how to excel when performing a procedure common in the ED as well as upstairs: ultrasound guided central line placement. 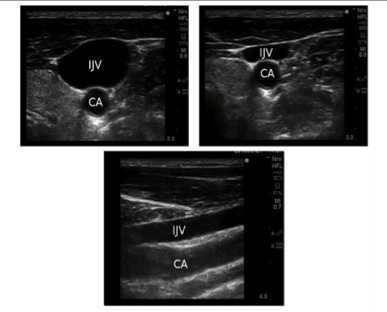 The three most common veins used in central line placement are the internal jugular (IJ), subclavian (SV), and femoral (FV). 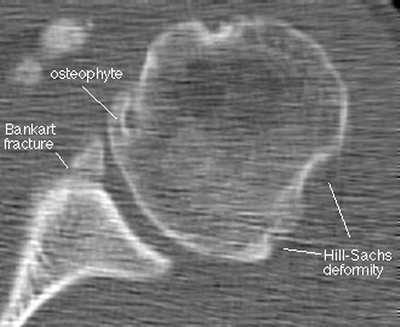 I will focus on IJ placement and the use of dynamic ultrasound. Sterile technique is paramount (if time permits). Linear array probe is used with a sterile probe cover, and sterile gel. A CVC kit is obviously required, along with sterile personal protective equipment. 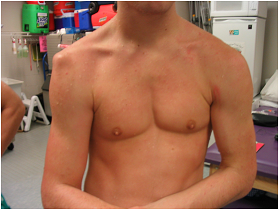 This procedure can be done with one person, but two can be helpful especially during training. Operator on the isiplateral side of the pt, pt in Trendelenburg, probe indicator to the left of operator, in transverse position. 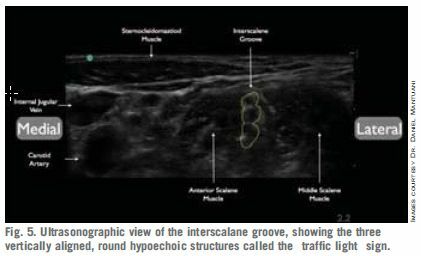 Place probe superior to clavicle, IJV usually larger, lateral to carotid artery. The IJV will compress with pressure, vs. the artery. If hypotensive or dehydrated, may disappear with inspiration. 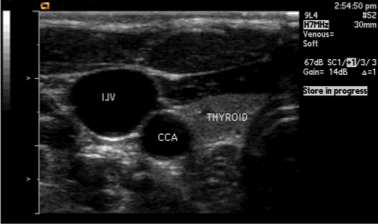 Center vein on screen, lidocaine can be used to anesthetize pt. Use center of probe as guide, while not looking at monitor, stick pt skin with entry needle. Look at monitor after puncture. 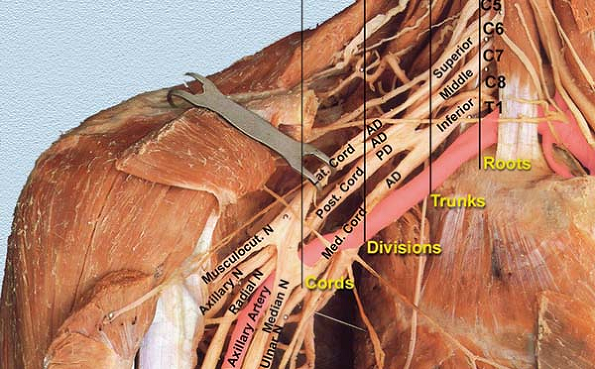 Visualize needle or tissue compression. Puncture vein looking at monitor. 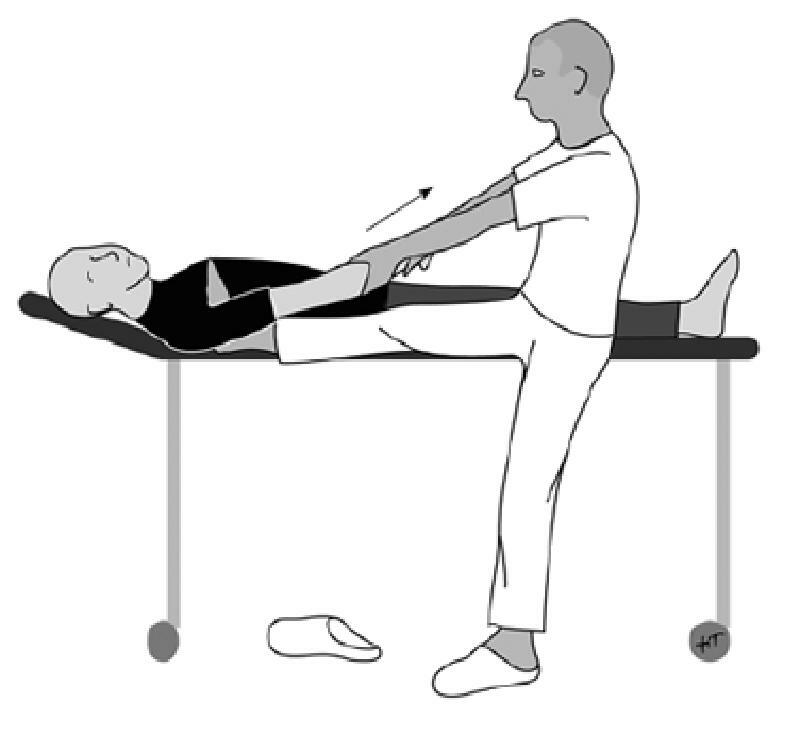 It is extremely important to visualize the needle tip and not proceed with advancement of the needle without visualization of the tip. The tip can be followed with slow fanning or sliding of the probe distally as you advance. The most common mistake is not following the tip of the needle and letting the needle get “ahead of” the probe. 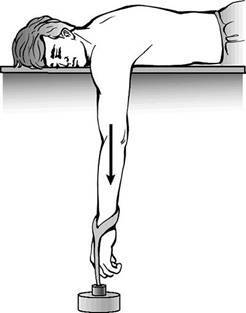 This leads to visualization of the proximal portion of the needle while the tip is in a different location in the neck, possibly causing complication. Everything you need to know about the eFAST in 60 seconds or less (120 seconds if you count the one minute ultrasound video). We’re back! Last time we reviewed eFAST basics and part of the eFAST technique. Hopefully you’ve been practicing the heart, RUQ, and LUQ scans like my friend below. So without further adieu…. I give you eFAST Part Deux! The Case: There are just too many eFAST cases to choose from. Which one to tell you…? Should I tell you about my first eFAST patient, the supposed-to-be-simple-but-really-wasn’t, on-coumadin guy who laid out his motorcycle? What about the lady from the rollover down a twenty foot embankment? Or the teenager from a horseback riding accident? Should I tell you about the night I hung out in resuscitation and did an eFAST on every patient that came through? A night in December I like to think of as Ultrasound Christmas. A night when a trauma alert rolled in and before I knew what was happening, the resident put the ultrasound probe in my hand and said “Go for it!” Needless to say it was AWESOME! Like do-a-secret-happy-dance-in-the-hallway-afterwards kind of awesome. 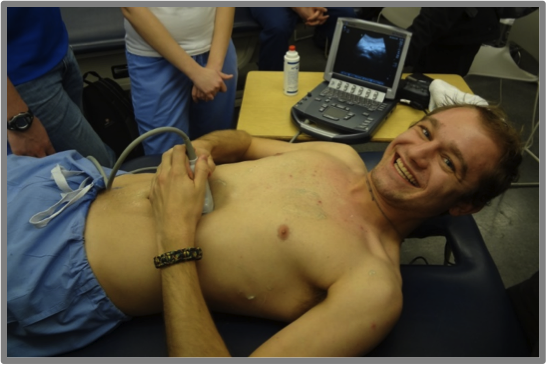 I’m definitely still lovin’ the ultrasound elective, especially since I’ve become competent at eFASTs. So what’s an eFAST you ask? It’s simple, really. It’s a systematic ultrasound scan to check for pneumothorax and free fluid (usually blood) in the abdomen and chest. It’s quick, easy, and incredibly useful. You don’t have to be a genius for this stuff. And it’s an ultrasound scan, so it means fewer patients being radiated by CT scans. Remember? Radiation bad. No radiation good. If you’re going to spend time in the ED, you should learn the eFAST. End of story. Plus if trauma’s your scene, you’ll get close to some wicked traumas. So now that you’re convinced… just how do you do an eFAST? The eFAST is a fast (pun intended) and easy way to check for blood in the chest and abdomen. eFAST is an acronym for extended Focused Abdominal Scan for Trauma. It’s an ultrasound exam designed for trauma patients that can be used at the bedside without interrupting ongoing care. Unstable patients with positive eFAST scans can then receive definitive care (get a chest tube, go to surgery, etc.) without the delay of waiting for a CT. 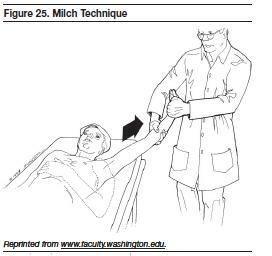 The exam is a set of scans that quickly visualize free fluid (like blood) in the anatomical sites it most commonly collects, so the trick to quickly interpreting an eFAST exam is learning just where free fluid tends to collect. An eFAST looks at the right upper quadrant (RUQ), left upper quadrant (LUQ), pelvis, heart, and lungs. (Lungs are the extended part of the exam. Without the lung component it’s just called a FAST exam.) So that’s five ultrasound views, six if you’re picky about the whole 2 lungs thing, and you’ve completed an eFAST exam. It takes less than 5 minutes to complete, but more like 2 minutes as you approach ultrasound rock star status. Plus it’s more sensitive than x-ray for conditions like pneumo or hemothorax. Basically, eFASTs are a great ultrasound scan for rapidly identifying bleeding and other common injuries in the trauma patient. The Patient: Who Gets an eFAST? How Do I perform an eFAST?